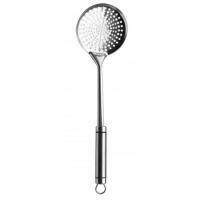 Skimmer | Kitchen Tools(KEB-203) - Keywood International Inc. This skimmer is perfect for serving dry food from the pot. The holes in the bowl drains the excess liquid. Suitable for dumplings, ravioli, pasta, etc. The handle has a slot for hanging when not in use. Large bowl surface makes it suitable for draining excess liquid from food or for serving dry food.